VERY FINE. THIS THE ONLY INTACT BLOCK OF THE 2-CENT PAN-AMERICAN INVERT. ONE OF THE MOST IMPORTANT AND INSTANTLY RECOGNIZABLE ICONS OF 20TH CENTURY AMERICAN PHILATELY. Ex Col. Edward H. R. Green, Philip H. Ward, Weill Stock and Connoisseur. Illustrated in Lidman's Treasury of Stamps (p. 81), Life magazine, "World's Rarest Stamps" (May 3, 1954). Exhibited in Aristocrats of Philately displays in the Anphilex 1971, Interphil 1976 and Ameripex 1986 exhibitions. With 2001 P.F. certificate. 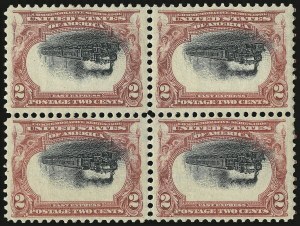 The Scott Catalogue price for this block does not accurately reflect its true value relative to the value of four choice singles. Copyright 2019. All rights reserved by Siegel Auction Galleries Inc. Information and images may be used with credit to Siegel Auction Galleries or siegelauctions.com subject to guidelines and restrictions.